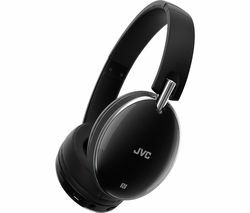 JVC Headphones look good and sound great. Each pair of JVC earphones is ergonomically designed for maximum comfort without ever compromising on sound quality. They deliver exceptional sound whatever you’re listening to, from house and techno to classical and rock. When you take the bus or train to work every day, JVC Headphones help you shut out the noise and distractions of the outside world and allow you to fully immerse yourself in your personal soundtrack. Working out in the gym is easier with JVC earphones as they allow you to listen to motivating songs that you’ve chosen. JVC Headphones are stylish, and because they’re so comfortable, you can wear them for longer, no matter what you’re doing. JVC earphones produce crystal clear highs, balanced mid range and deep bass tones, so they’ll complement your tunes no matter what you’re in the mood for. If you’re looking for stylish headphones that are capable of delivering incredible sound, while shutting out the noise of the outside world, take a look at our collection of JVC on ear headphones. And if you’re looking for a pair of headphones that are perfect for the gym, take a look at our range of JVC in ear headphones. Whether you’re looking to upgrade your current headphones or you’re looking for a second pair, JVC Headphones are ideal.